If you have any questions or remarks, by all means send a message to Webmaster Art. The charges will appear on your credit card as WWW.ARTWARE.NET and will be billed in EUROS. Artware runs a number of story websites, where users can submit stories that will be published on the site. Site visitors can read stories and rate them with our voting system. Access to the site is permitted free of charge. All you have to do is enter your email address, to set up a free account. Stories that are older than 30 days are moved into the ES FANCLUB. Access to the FanClub is available for a monthly fee of just $14.99, automatically billed every month to your credit card or checking account. 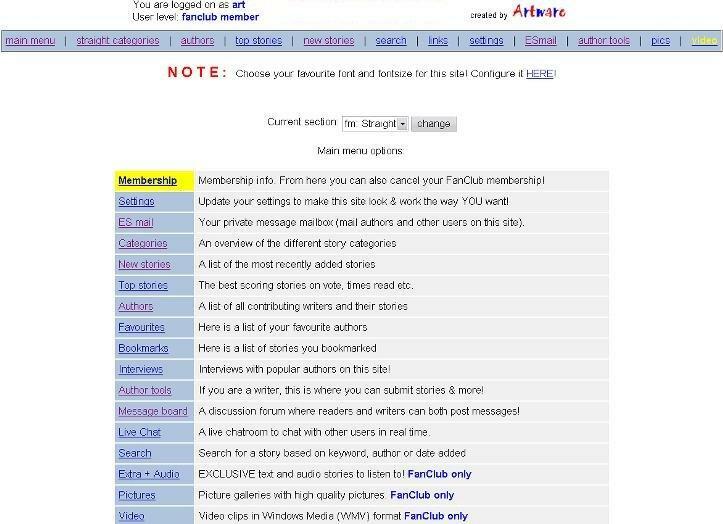 Members of the FanClub get access to a number of other bonus features, more content and increased functionality on the site. Memberships can be cancelled at any time. You can either do this from within the FanClub section of the site (with just a few mouseclicks), or by emailing Art, the webmaster at join@artware.net.